If Washington’s budgetary gladiators are to avoid the fiscal cliff, then they need to work in smaller groups; avoid the media; dismiss objections from colleagues, core constituents and lobbyists; and put the good of the country before their own political futures. Such was the rough consensus among a panel of veterans of the historic 1990 Andrews Air Force Base budget talks that produced a $500 billion deficit reduction package and the Budget Enforcement Act that eased record deficits and was credited with helping set straight the country’s finances for much of the 1990s. The old-home-week event in a Senate hearing room Wednesday reunited such erstwhile headline names as former House Speaker Tom Foley, D-Wash.; former White House chief of staff and New Hampshire Republican Gov. John Sununu; former Senate Budget Committee leader Pete Domenici, R-N.M.; and former Reps. Dave Obey, D-Wis., and Bill Frenzel, R-Minn. Though most expressed optimism that the current impasse is solvable, all agreed that political culture has coarsened during the past 22 years and that good lessons can be learned from the unlikely success of the bipartisan budget deal that shaped President George H.W. Bush’s only term. “The past is not necessarily prologue,” said former Rep. Tom Davis, R-Va., now with Deloitte & Touche, which co-sponsored the panel with George Mason University and the Bipartisan Policy Center. “Today’s political parties are much more polarized and ideologically sorted,” he said, pointing to computer-drawn congressional districts that cause incumbents to fear primary challenges. New, agenda-driven media models at cable networks, as well as Internet tools “in which the crap-to-content ratio is very high,” mean that angry voters can instantly “light up the switchboards” on Capitol Hill so that extremists have more leverage than leaders, he said. And current campaign finance rules give outside entities greater power than the two political parties. “It’s not what I’d call efforts to bring us together,” Davis added. What’s missing now, said Foley, “is not only bipartisanship, but transpartisanship,” which required the players who in 1990 were confined for 11 days out at Andrews “to step forward and dismiss the concerns” of fellow lawmakers. “We thought even a group of eight was too many at one point,” he recalled, stressing the importance of stopping news reporters from encouraging fights among participants. “I hope today we can get something close to” what was achieved in 1990, Foley added. He warned against a “highly dangerous” suggestion by Sen. Patty Murray, D-Wash., that Democratic negotiators consider going over the fiscal cliff for a few weeks rather than settle for a bad deal now. The 1990 deal was voted down the first time it went before the House and was blamed by many for the subsequent defeat of the first President Bush for violating his famous “Read my lips” pledge against tax hikes. It then was altered and paired with the Budget Enforcement Act, which included the pay-as-you-go mechanisms and policy-specific spending caps that improved the fiscal balance during President Clinton’s administration. The talks unfolded, noted William Hoagland, former staff director of the Senate Budget Committee, when the Democrats held clear majorities in the House and Senate. The 1985 Gramm-Rudman-Hollings law was threatening across-the-board budget cuts of 31 percent for defense and 35 percent for nondefense spending (triple the current threat under sequestration). And Iraqi dictator Saddam Hussein decided in August 1990, just as the talks were in full swing, to invade Kuwait, which prompted the first Gulf War. Describing the obstacles, Reischauer said Bush’s budget “was based on unrealistic assumptions and didn’t include money for the savings and loan bailout.” The Democrats controlling Congress were more worried about the institution’s reputation than is the case today, he said. Also, the presence of too many staff members out at Andrews prevented progress until toward the end. But once small groups of leaders worked a deal, he added, they set in motion history’s “longest and most robust expansion of the economy.” The flood of incoming revenue, he acknowledged, was enhanced by the dot-com boom, accommodations by Federal Reserve Chairman Alan Greenspan and concessions by Soviet Union President Mikhail Gorbachev that permitted a U.S. defense drawdown. 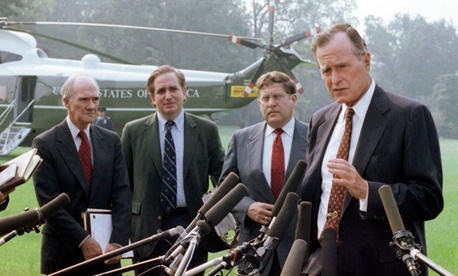 The context for the 1990 talks was set about six months before the bills’ passage, said Sununu, who recently advised the Mitt Romney presidential campaign, when Treasury Secretary Nicholas Brady heard worries from international bankers that the United States needed a stabilizing fiscal framework. “Six months seems fairly efficient in hindsight,” he said, describing how the administration set out to avoid tax rate hikes -- the central issue in 2012 -- and planned for a 3-1 ratio of spending cuts to revenue increases that was later altered in the Democrats’ favor. Bush “was determined to solve the issue and was the fundamental catalyst, but he ended up sacrificing tremendous personal political capital,” Sununu said. “But a no-politics climate will never happen-- it’s the cement that holds it all together.” He recommended that politicians today stick to their philosophical principles but not to any personal agendas. “The climate was different then, which wasn’t accidental -- we worked hard at it,” Sununu said, adding that the period also saw passage of an updated Clean Air Act, the Americans with Disabilities Act and a Civil Rights bill. The lesson, Obey said, is to pursue realistic, smaller deals rather than large ones that don’t deliver.